I feel a song comin’ on – ” … when the moon hits your eye like a big pasta pie, that’s amoré …” – another gorgeous, glaring example of perfection right under our collective noses! 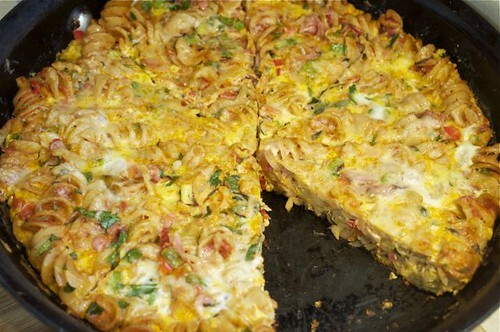 Again, this is a METHOD and the recipe is up to you! 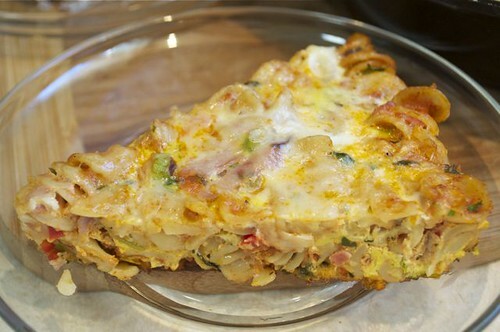 For every cup of leftover pasta, and I mean any pasta – whether it’s loaded with vegetables, spicy sausage, succulent seafood, smoked chicken, meatballs – and whether it’s sauced with tomatoes, cream, pesto, olive oil – it’s all fair game to morph into a frittata. You can start with a few diced odds and ends (a brilliant use for leftover bits) to a hot pan – or not, pile in the pasta, shred a little cheese – sharp for flavour, not so sharp for texture, whisk the eggs and pour over to evenly coat. Start it on the stove, finish it in the oven and you’re done. So on that note – your world will now shine like you’ve had too much wine, thanks to a pile of leftover pasta, whisked up eggs and if you’re in the mood – whatever you have hangin’ around in your pantry, fridge or freezer – now that’s amoré! 1. 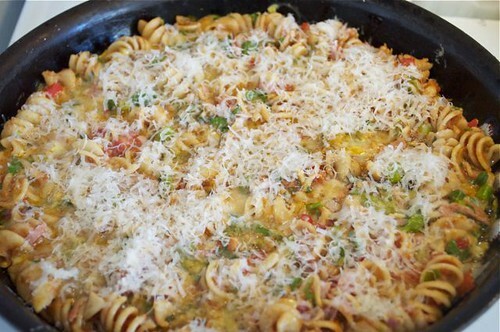 Start with your leftover pasta. 2. 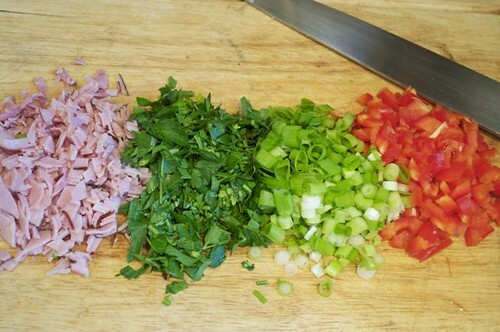 Chop up any additions if you’re going there – here I’ve got ham, parsley, scallions & red pepper. 3. 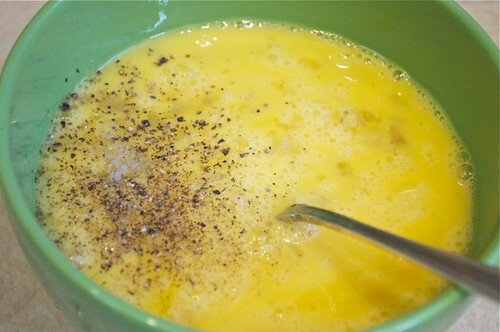 Whisk an egg for every cup of leftover pasta. 4. 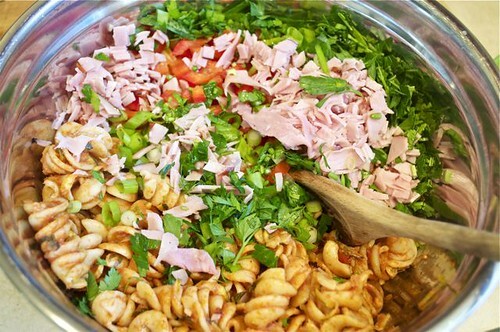 Stir any additions into the pasta. 5. Whisk and season the eggs. 6. 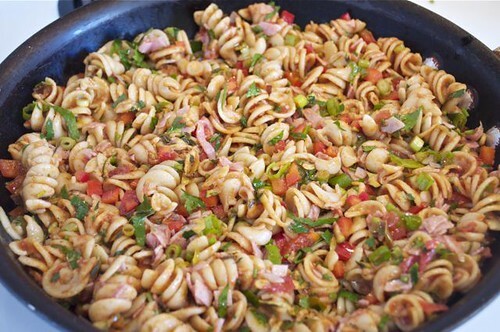 Pile the pasta into a hot pan swirled with olive oil. 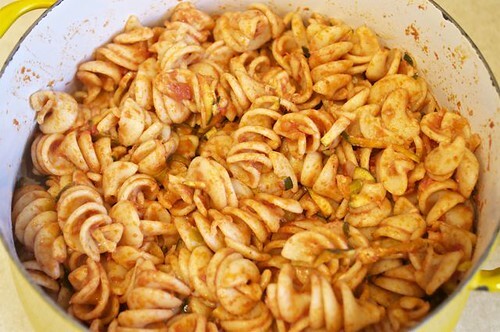 You could sauté any additions and then add them to the pasta or stir them directly in as I did. 7. 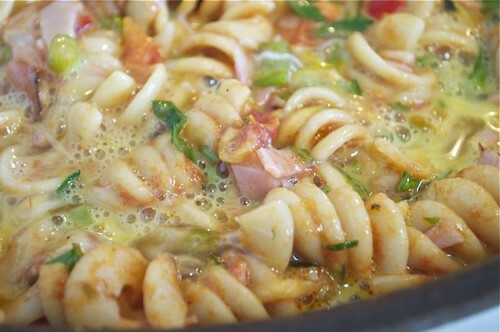 Pour the whisked eggs as evenly as possible over the pasta. 8. 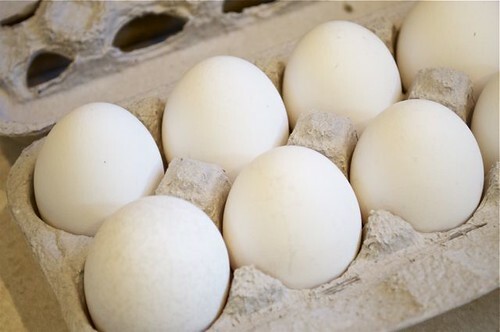 Tilt the pan to get the egg into all the cracks and crannies – if you find you need more egg, simply whisk another egg or 2 and get it in the pan. 9. 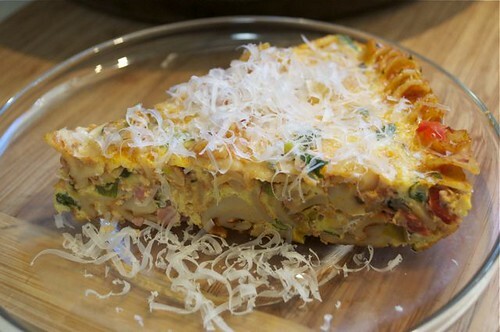 This egg will set turning your pasta into a frittata. 10. 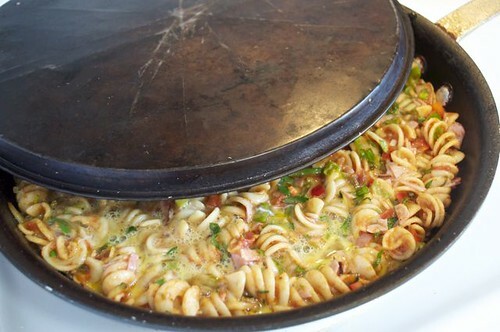 I find if you pop on a lid (I used my pizza pan) it helps hold in the heat to set the bottom faster. You know it’s ready for the oven when you peak under the edge and it’s firm. 11. 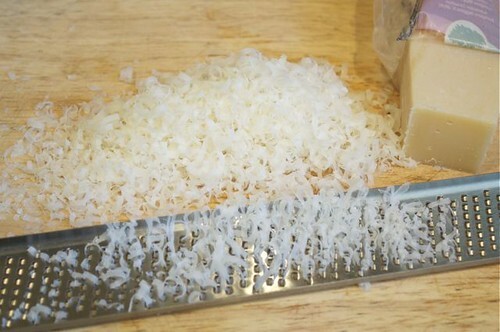 While you’re waiting for the egg to set up, grate a little cheese. 13. Sprinkle it on the top before putting it in the oven to finish cooking – another 10 minutes or so. 14. Just jiggle the pan – if everything stays where it is, it’s done. 15. 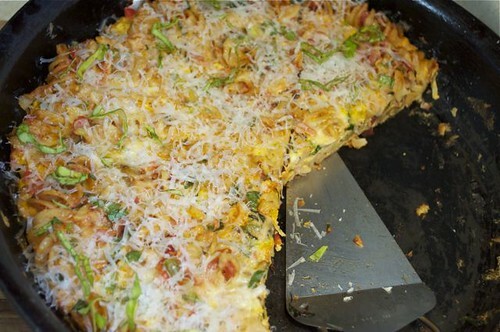 Run a knife around the edge to loosen before cutting the frittata just like you would a pizza. 16. And the pieces will lift out easy peasy. 17. Let’s have a look – the egg is perfectly cooked, holding the past together like church! 20. 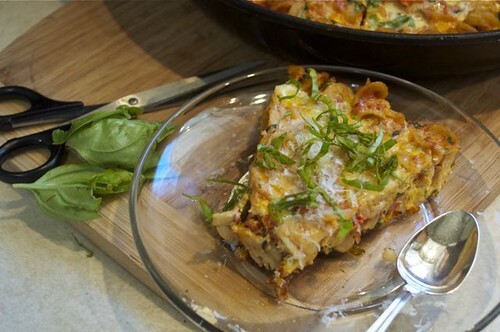 Or snip a few fresh herbs over top – basil is yummy. 21. 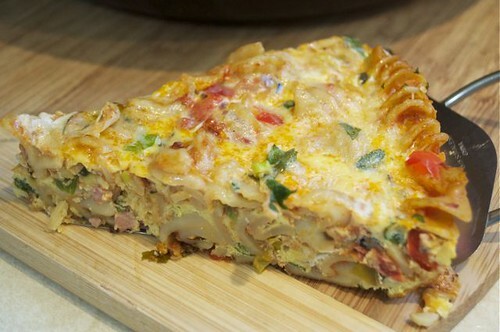 This’ll disappear so fast you’ll wonder why pasta frittatas haven’t darkened your door before. 1. 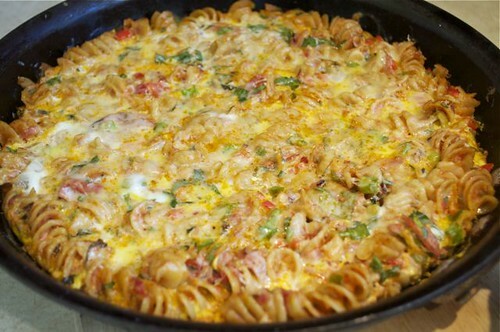 For every cup of leftover pasta, add one egg. 3. 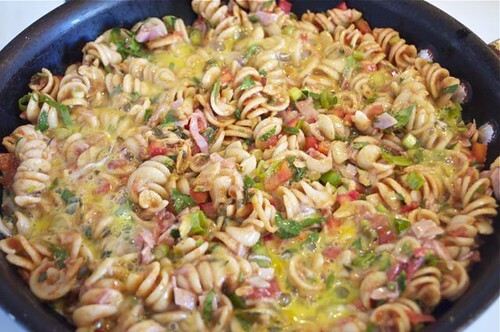 Whisk as many eggs as cups of pasta and set aside. 4. 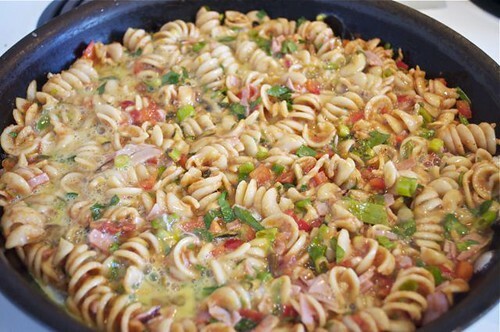 Set an oven-proof pan over medium-high heat, swirl with olive oil and add the pasta, spreading out evenly. 5. 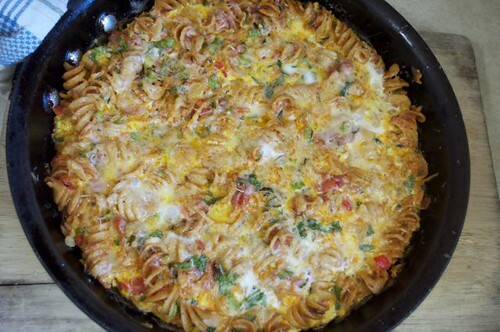 Pour the whisked eggs over the pasta, tilting the pan to distribute evenly. 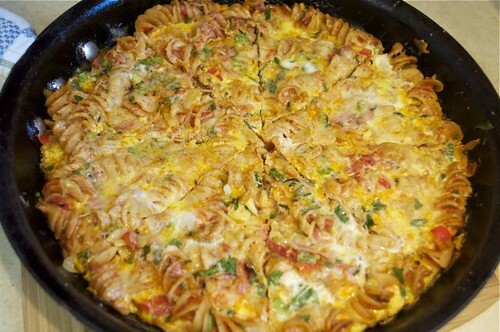 If you need another egg or 2, just whisk it up and add it to the pan. Cook on the stove-top for 5 -8 minutes until the bottom is set. 6. 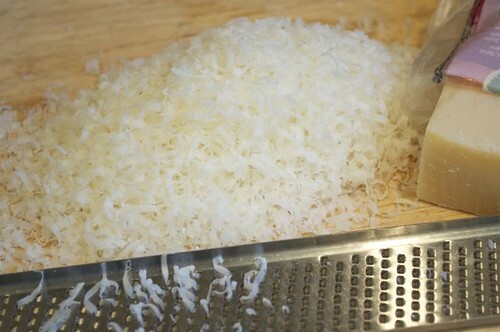 Grate the following & sprinkle evenly over the top before finishing in the oven for another 10 minutes or so. 7. Allow to rest before running a knife around the edge for easy removal. Cut like a pizza and enjoy! Also try it with any stir-fries (rice or noodles), roasted vegetables or a combination of whatever odds and ends you have – eggs are such a clever ingredient, glad you have a new way to serve leftovers!